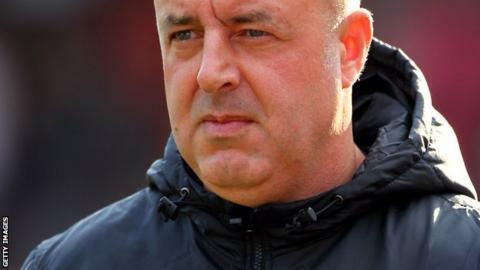 Keith Hill has been pleased with the level of Rochdale's performances since he returned to the club last month. The 43-year-old on 22 January following the dismissal of John Coleman. "There's a decent nucleus of players there to work with and I'm encouraged by the two performances that we've had," Hill told BBC Radio Manchester. "The players have been magnificent to work with, but we've got to continue in the same vein. We've got to turn these draws into three-point results. "With 16 games to play, there's still a lot to play for. It's quite a condensed league and I don't think there's too much difference in quality between position A and position Z." Dale are currently 15th in League Two, eight points from a play-off spot. Hill was out of work for less than a month before taking control at his previous club. And he says his passion for the game has been reignited since taking the job, adding: "It's been brilliant to be back. I'm happy and there's a lot to be said for being happy. "I think my family have noticed the change in me over the last couple of weeks - I feel as though I've come out of a footballing coma."